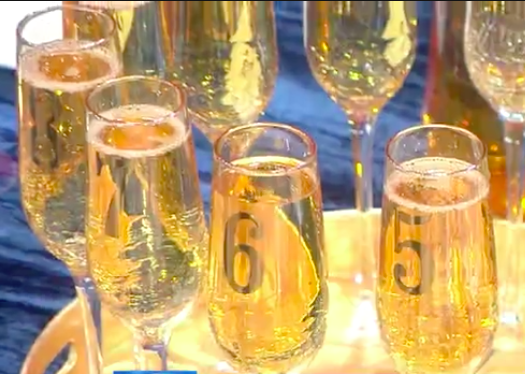 Is there a better way to ring in the new year than with a glass of champagne…or two, or three? Elevate your average glass of champagne by creating a simple and chic cocktail with a spin…a Countdown “CLOCKtail!” All you need to create this adorable display is plain champagne glasses like these or these and stick-on numbers (2″ metallic vinyl numbers work perfectly).  Label the glasses with numbers, 1-12, and display on a circular tray. Add some clock hands to the center of the tray to make it more realistic and place a stack of gorgeous cocktail napkins nearby and voila! Not only is a clock-tail festive, but has the added bonus of guests being able to keep track of his or her own numbered glass! Try one of our fave champagne cocktail recipes: mix a splash of St. George’s Spiced Pear Liquor with a glass of champagne, garnish with a citrus twist, and if you’re feeling especially fancy, a sprinkle of edible gold leaf flakes! And speaking of champagne…better stock up on plenty of bottles for your guests! 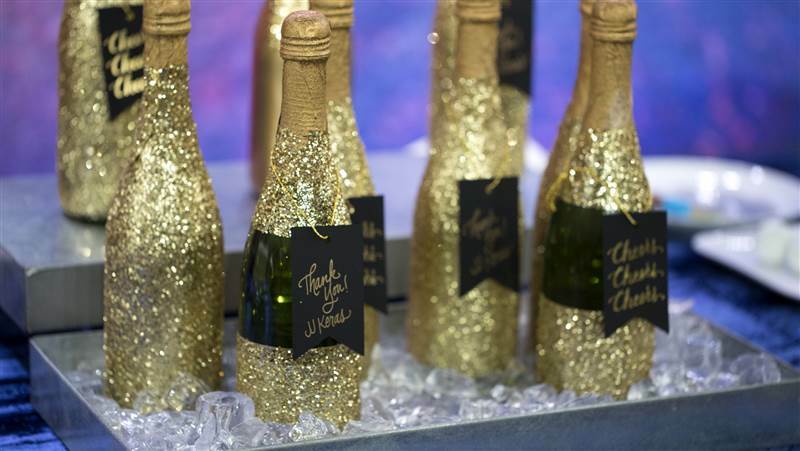 To up the “wow” factor on a standard bottle of champagne, it’s time to get crafty; glittered bottles look festive but require minimal effort. To create a glittered bottle, simply use a foam brush to “paint” a thin layer of ModPodge glue directly onto the bottle. Then, sprinkle glitter over the entire area, let dry for a couple of hours, then finish with a coat of clear spray. Experiment with colored spray paints, different textures of glitter and using painters tape to create unique patterns and designs. Not only is this a great way to add flair to your toasts, but when the bottle is empty, fill with branches or flowers for the perfect tabletop display. These also make a fabulous hostess gift that’s sure to land your name on the invite list for next year’s soiree! 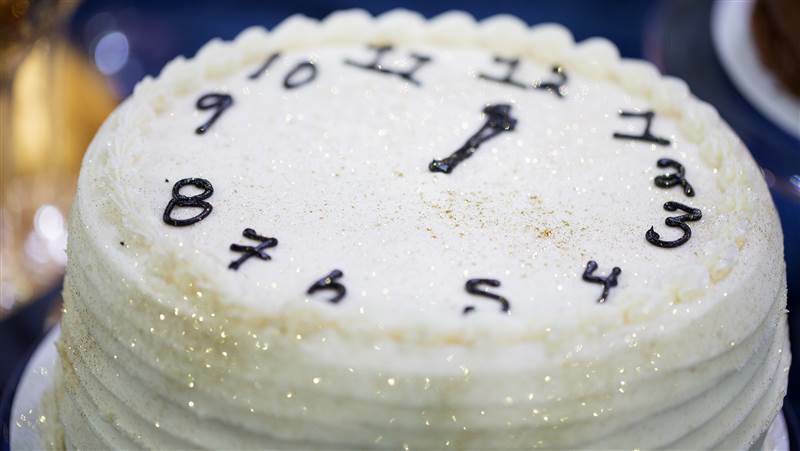 Another super simple last minute dessert idea is to create your very own clock cake. Simply pick up a basic iced cake from the bakery or grocery store, then add some flair! Numbers and clock hands are easily added using icing or you could also use craft store wooden numbers year after year to create this confection. Top with edible glitter for a little extra sparkle…no guarantees that it will last past midnight! 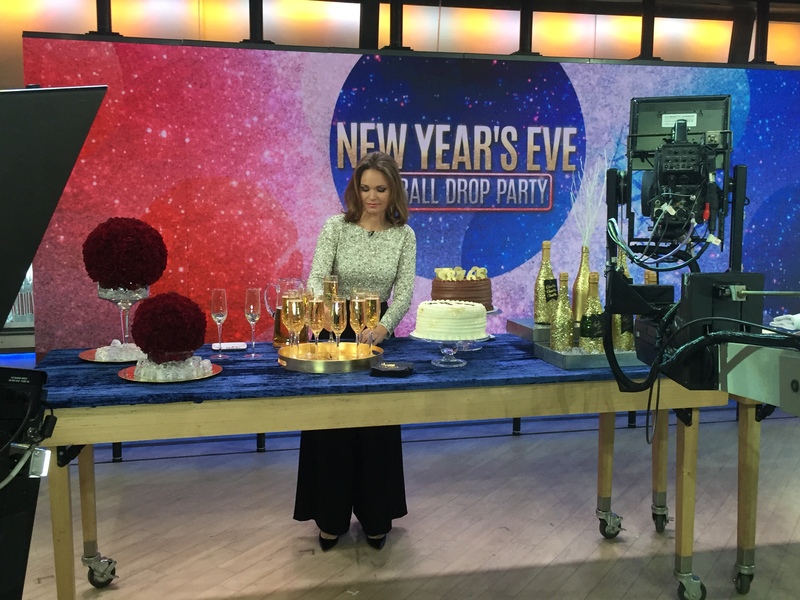 New York City hosts one of the most famous New Year’s Eve parties in the world…with the biggest global attraction being the Ball Drop in Times Square! While you might not be able to be there in person to see the sparkling, 11,875 lb. 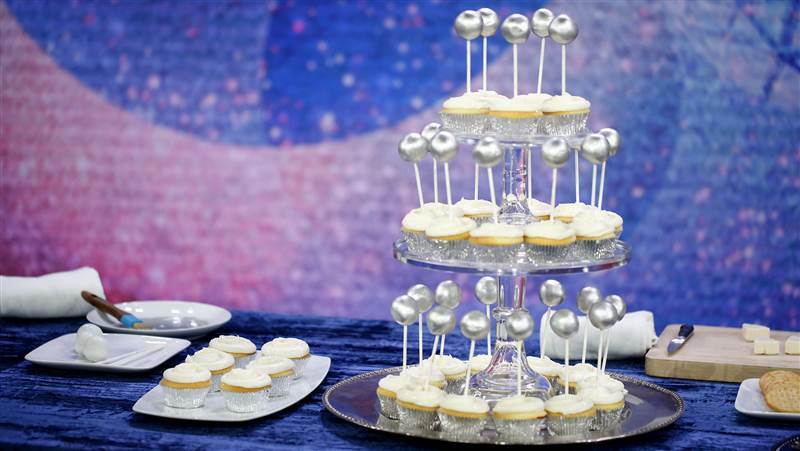 Waterford Crystal ball descend, a sweet party treat can pay homage to this beloved tradition. Its easy to whip up a batch of cake pops or Oreo balls and coat them in white baking chocolate. Then, once the pops have hardened, coat them in edible luster dust or shimmering glitter! Place each pop in a cupcake for a creative and delicious display.  Learn interesting facts about the Times Square Ball and its history here! 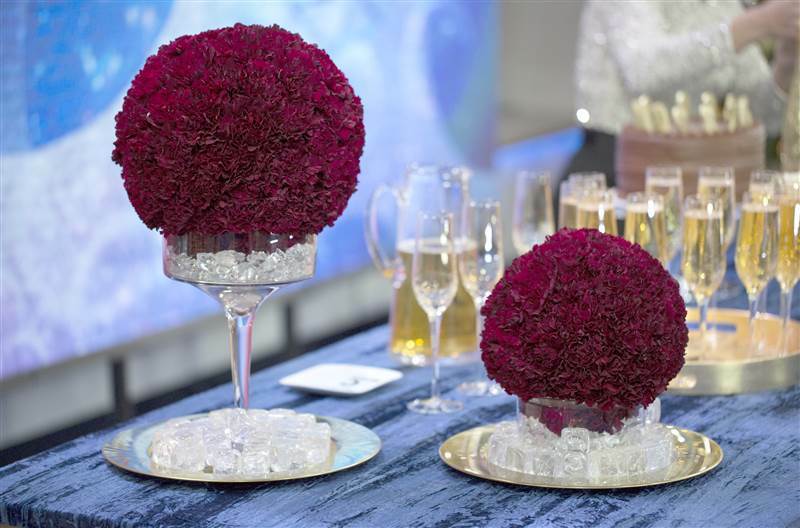 Modern flower balls are a great way to add interest to your New Year’s tablescape while also echoing the “Ball Drop” theme of the cupcakes. Placed atop vases or candlesticks or hung from the ceiling on monofilament wire, these floral creations are so chic and make a grand statement.  To DIY these beauties yourself, all you need is floral foam balls in various sizes and flowers. We especially love the monochromatic look of deep crimson carnations. Then, snip the blooms off the stems and stick into the foam balls until they are fully covered. No matter what the dress code is at your party, keep the hors d’ oeuvres looking classy by making these adorable cheese n’ cracker tuxedos! While these little snacks require no cooking, they do take sometime to assemble which might be perfect for little helpers in the kitchen. 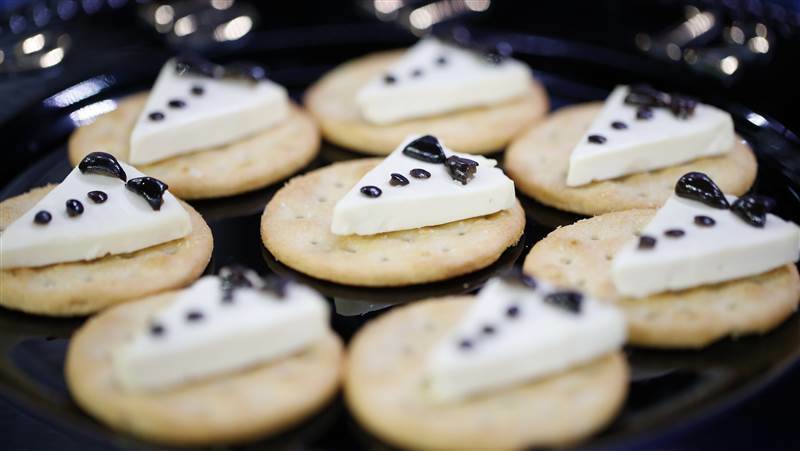 Simply top a cracker with a wedge or slice of cheese (like Laughing Cow, white cheddar, or Brie) then add tiny pieces of black olives as the tux details. In keeping with the countdown theme, these nibbles look adorable displayed on a black tray with clock numbers affixed to the tray edges. 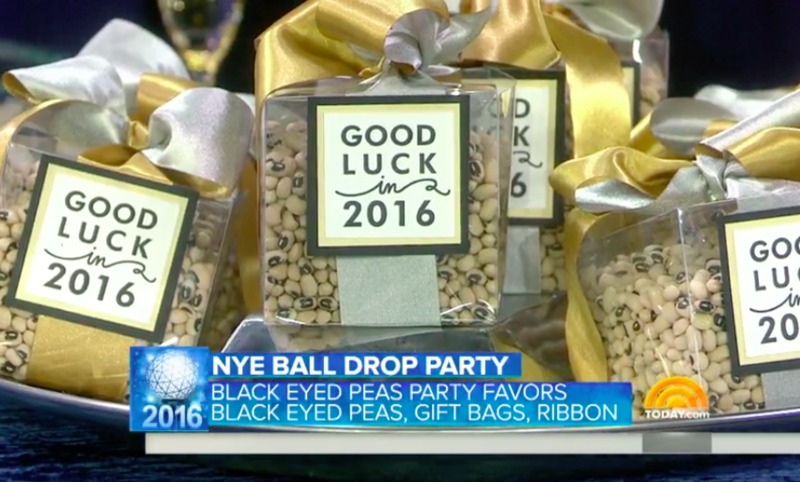 At the end of the evening, a fun parting gift for your guests is a little something that also promises to bring health and good fortune in the upcoming year…black eyed peas! Many Americans uphold the tradition of eating peas on New Year’s Day, so save your guests the grocery store run and send them off with pre-packaged treat bags filled with the dried peas. Adding a cute gift that also includes cooking instructions adds a nice touch your guests are sure to appreciate.  Here’s to happy and healthy to you and yours in 2016!